The payment method you use online is more important than you might think. Check out the reasons why a credit card is the smartest option when shopping online. © Provided by The Motley Fool, Inc Woman holding credit card and shopping on a laptop. Being that it’s the 21st century, just about everyone shops online. For some of us, it’s the occasional order on Amazon or eBay. For others, it’s clothes, electronics, groceries, and all of life’s necessities. Consumers usually put more thought into what they’re buying than how they’re paying for it, but whether you pay by debit or credit card is actually an important consideration. That’s because credit cards present several advantages that make them a much better choice when shopping online. With the rare exception, you get nothing back when you make a purchase with your debit card. You spend the money, it gets deducted from your account, and that’s that. It’s a different story with credit cards, as rewards have become a common perk. Among the best credit cards, you’ll find both cards that offer cash back and cards that earn points you can use to purchase travel. In some cases, you may even be able to earn bonus cash back or points with your online shopping. 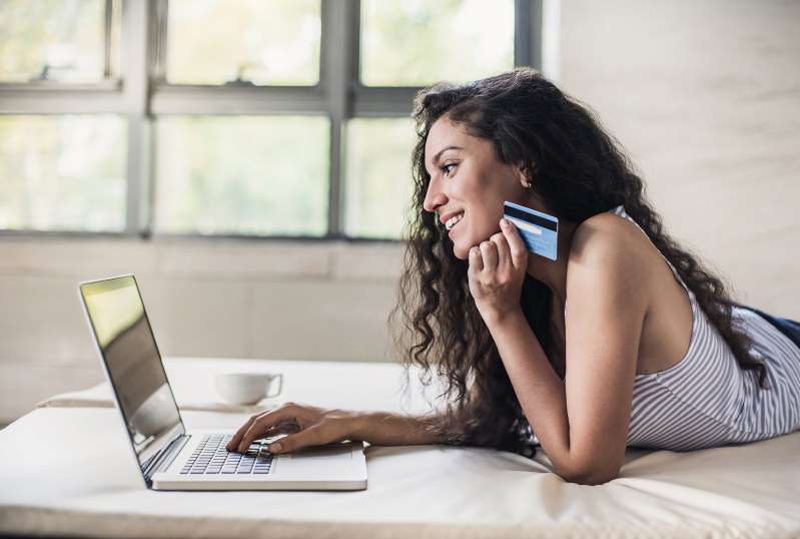 Some cards can earn more back at certain online retailers, and many card issuers also have online shopping portals you can go through to earn more points. For example, you may be able to earn 3 points per $1 instead of 1 point per $1 shopping at a specific store, but only if you go to the retailer’s site through your card issuer’s shopping portal. Online transactions are generally secure, especially when you’re shopping with major retailers, but people do occasionally get their card numbers stolen. If your number does get stolen, a stolen credit card number is much less of a hassle than a stolen debit card number. Once somebody has your debit card information, they essentially have access to the money in your account. They can spend your money and drain your account, at least until you or your bank notice the fraudulent transactions. You should be able to get any stolen money reimbursed, but that can take weeks. Although a thief can also make purchases with your credit card information, they won’t be able to touch the money in your bank account. Sometimes you make a purchase from an online retailer and it doesn’t deliver -- either literally, like when you never get what you ordered, or figuratively, like when your order doesn’t live up to the description of what you purchased. Step one is to take it up with the merchant, but if that doesn’t work, then you’ll need to dispute the transaction. And just like fraud is easier to deal with on a credit card than a debit card, so are disputed transactions. For one thing, the transaction will only be on your credit card, and the money won’t be out of your bank account. Credit card issuers are also typically proactive about fighting for their cardholders to provide a quality experience and build brand loyalty. Let’s say you buy a computer online, and then see it for 40% off two weeks later. Or, your brand-new computer gets stolen a month after you bought it. If you made that purchase with a credit card, then you may have some recourse in those scenarios. Many Mastercard and Visa cards, and all American Express cards, offer protections for just these types of situations. Price protection -- Covers you if a product is available for a lower price than you paid. Purchase protection -- Covers your purchases against damage or theft. Extended warranty coverage -- Automatically extends the manufacturer’s warranty on a product. All these protections have their limits, but they’re nice to have in case you need them. It’s not that debit cards are a bad way to shop online; they simply don’t have the benefits or protections that credit cards have. You’ll be more secure using a credit card, you could get some protections on your purchase, and you can earn cash or points back on your spending through credit card rewards.